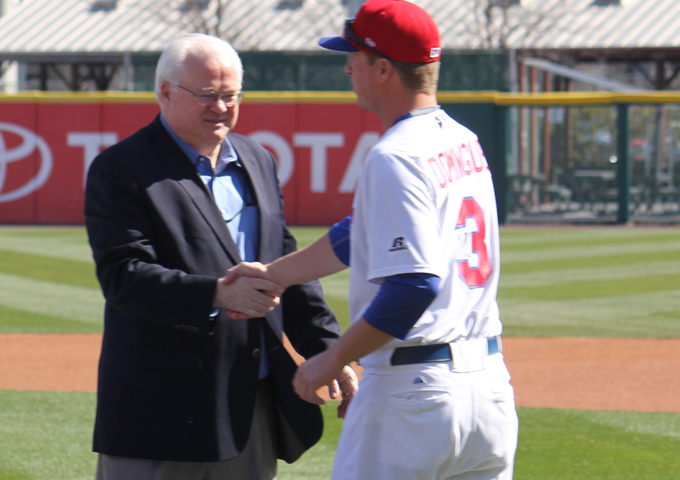 The president of Minor League Baseball, Pat O’Conner, was in town last week, making the visit to Coca Cola Field to deliver a prestigious award to Buffalo Bisons third baseman Matt Dominguez. Playing last season for two different teams in the AAA Pacific Coast League, Dominguez earned the Minor League Gold Glove Award, one of the top distinctions in all of Minor League Baseball. The award was presented in a short pregame ceremony onfield prior to last Saturday’s Bisons game at the downtown ballpark. So just who is Pat O’Conner? Not exactly a household name in baseball circles, but O’Conner heads the St. Petersburg, Florida based staff that oversees all of the teams in the National Association of Professional Baseball Leagues. And that includes the International League, to which the Bisons belong. O’Conner has spent 23 years in that office, elevated to the title of president in December of 2007. In his tenure with the NAPBL, O’Conner has seen minor league baseball teams grow to new heights in terms of revenues, attendance and franchise values, along with a spate of new construction of ballparks throughout the country and at every level of the sport from short season A all the way to AAA. Back in August of 2014, the Buffalo Bisons announced that they have teamed up with the design firm Populous to do a study for what is hoped to be a dramatic remodeling and remake of Buffalo’s Coca Cola Field, now in its 29th season the second oldest park in the International League. At that time the team announced that all special reserved 100 level seats would be replaced with new and wider Kelly green seating, and that was completed in time for the 2015 season. Since that announcement, things have been quiet from the executive offices at One James D. Griffin Plaza, except for occasional pronouncements that work is in progress and the public and the media would be informed in due time of the team’s plans. So we sat down with O’Conner, who has toured and visited most of the minor league stadiums throughout the country, including the newest one, Spirit Communications Park, which opened just last week in Columbia, South Carolina. The major question – what would he suggest for design elements for downtown Buffalo’s Coca Cola Field. With over 160 team clients, we put O’Conner on the spot… what’s his favorite ballpark. “I get that question all the time, it’s like asking which is your favorite child,” O’Conner laughed.